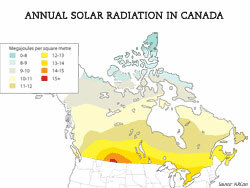 Canadian Wildlife Federation: How effective are solar panels in Canada? As we might expect, the closer a country is to the equator, the more solar radiation it will receive, and the idea of harnessing that energy with solar panels makes perfect sense. But what about northern countries like Canada that spend many months of the year in the depths of a grey winter, where the sun is low in the sky and the solar gain is minimal? Enlarge map As it turns out, despite our northern location, Canada, too, receives enough solar radiation to make powering PV panels a worthwhile option for homeowners. Most of Canada receives at least seven megajoules of sunlight each day — that's enough to supply an average household's power requirement of about 2,000 watt hours from one 200-watt PV panel!